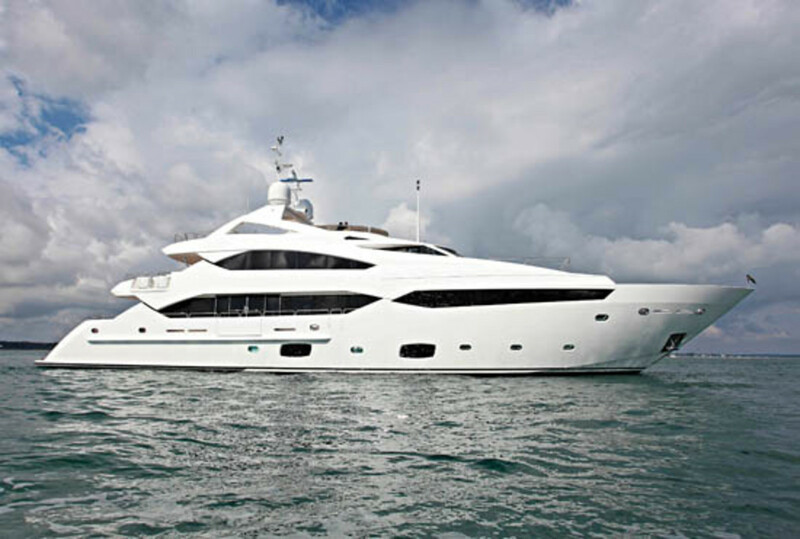 Sunseeker’s 40 Meter outdoes her 37-meter sistership in every way that counts. Sunseeker has grown in the last 40 years or so into one of the strongest global brands in boatbuilding, but as a company it remains proud of its British roots. 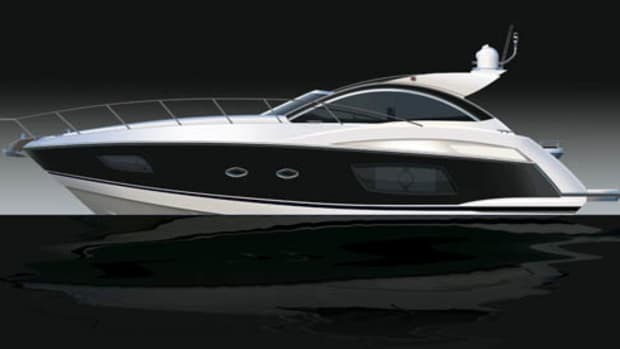 That means, whenever possible, new models are launched at one of the shipyard’s home boat shows. Sometimes this can be at London, in January, but more likely it’ll be at Southampton in September: that long-standing fall fixture on the U.K. boating calendar, renowned in equal measure for its festive atmosphere, infectious enthusiasm, and fantastically unreliable weather. It’s a quick cruise east from Sunseeker’s shipyard in Poole, that vast natural harbor sheltering behind the white chalk cliffs of Dorset’s Jurassic Coast, to the show pontoons in the busy shipping port of Southampton, with its double high tides and the ceaseless comings and goings of ferries, tankers, and cargo ships. 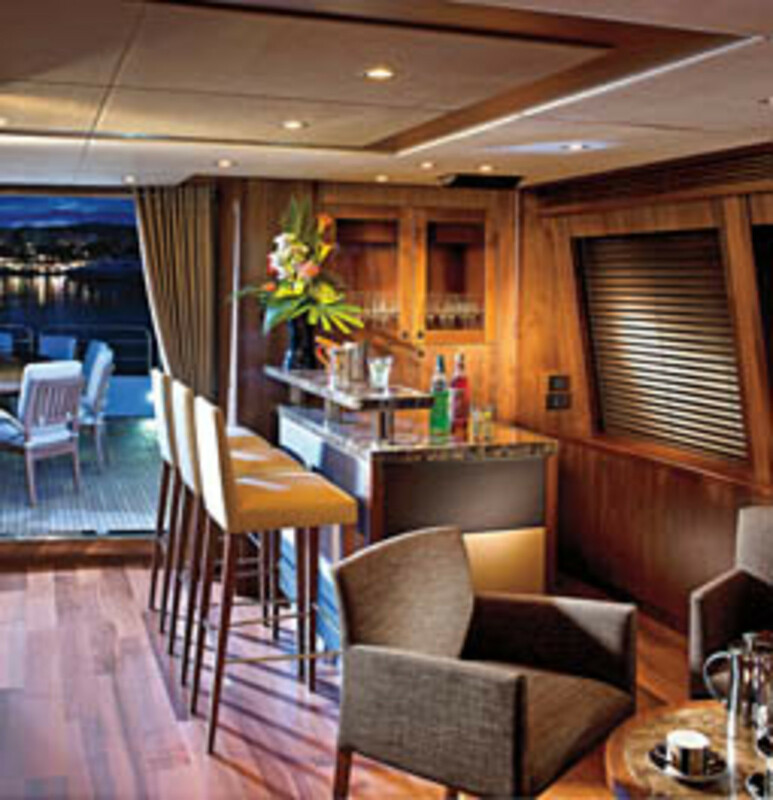 The upper deck on Sunseeker’s 40 Meter features a great private bar. Tanvas, the first 40 Meter and the largest Sunseeker yet, made the short trip in good time for the opening of the show, changing the landscape as soon as the delivery crew secured her lines to the pontoon. Towering three decks high, she dwarfed every other exhibit in Southampton. 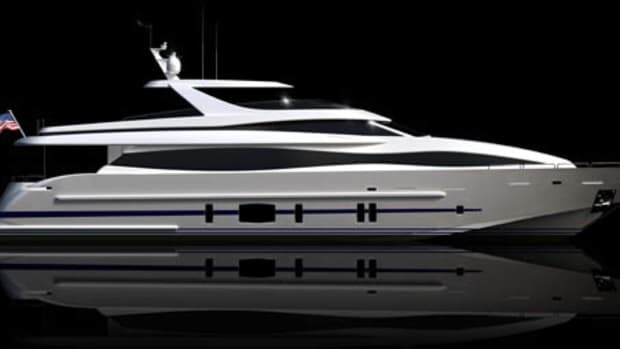 Two years ago the Sunseeker 37 Meter had much the same effect on its arrival in London, and the 40 is that model’s natural successor, sharing the same hull geometry and beam, as well as waterline length, but with the addition of a longer stern that completely transforms the yacht’s profile. Where the 37 looks rather tall for its length, the 40’s extra ten feet add a sporting elegance aft, raked at an angle which perfectly complements that aggressive stem. With an exhaustive selection of layout options underlined by the shipyard’s willingness to go the extra mile—and often further—to meet owners’ needs, virtually every Sunseeker in this size range is a custom-built one-off. 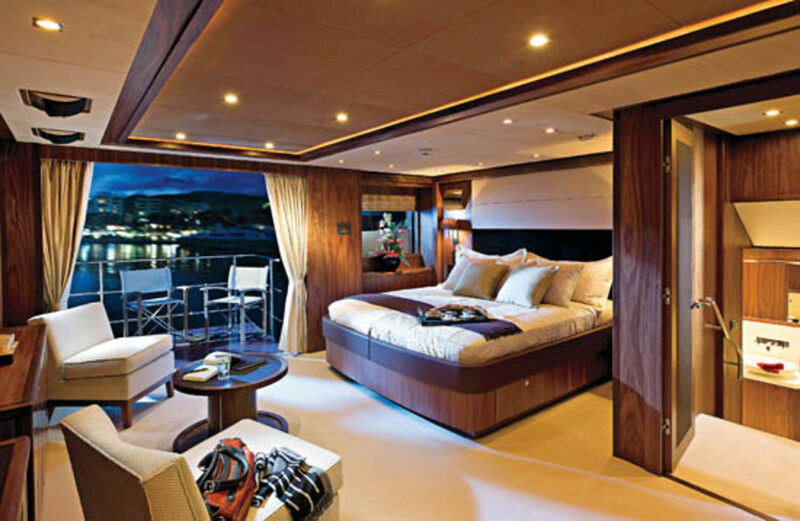 Tanvas was built for chartering and destined for the Far East, and her satin-varnished American walnut joinery, pale fabrics and furnishings, and contrasting deckheads add up to an interior that is typically Sunseeker: designed to impress not with ostentation and opulence, but with a relaxed and elegant understatement. It’s a combination that will be easy to live with while onboard. A VIP stateroom is also up on the upper deck. Understated or not, Tanvas is nevertheless loaded with options. Some are fundamental to her cruising area, like the additional fuel tank to ensure that she can cruise independently of shoreside services for weeks at a time. 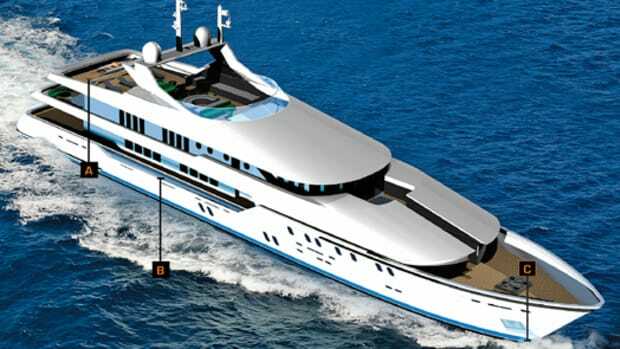 It adds some 1,500 gallons to the standard capacity and provides a cruising range of 900 NM at 18 knots. Some are vital but hidden behind the scenes such as the oversized chilled-water air-conditioning system and extra insulation to cope with tropical heat and humidity. And some of her options are plucked unashamedly from the nice-to-have list. None is nicer than the fantastic fold-down balconies: not one, or two, but three of them. The biggest balcony, naturally, is the exclusive preserve of the person signing the checks. 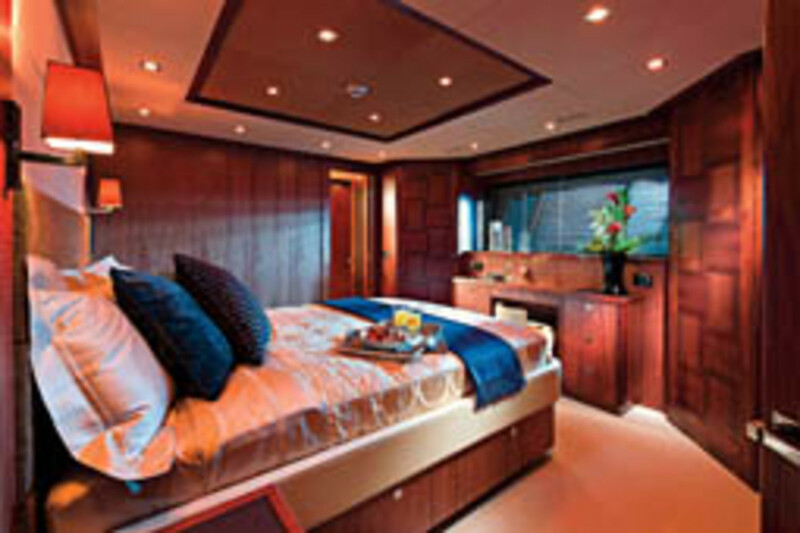 The master stateroom on the main deck is a substantial split-level apartment. 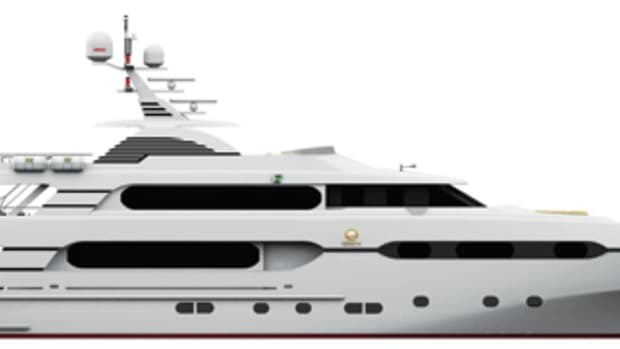 Down four steps forward, the big bathroom occupies the yacht’s full beam while the sleeping area has huge windows on both sides, a comfortable separate seating area, and of course, that superb private balcony to port. The other two balconies are on each side of the saloon, and they open up this central entertaining area to the outside world in a way that will prove spectacular in Tanvas’ tropical cruising grounds. 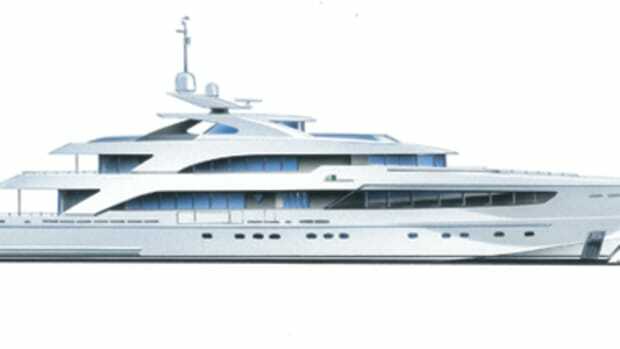 Her owner also specified a custom-built bar that faces both inside and out, thus serving the capacious cockpit as well as the saloon seating areas. An enormous dining table is set in its own area amidships and seats 12. Close at hand, the galley is forward to port and was designed with serious catering in mind. It has a large central island and plenty of surfaces to allow two or three kitchen staff to work together. Crucial for formal dinners, there is enough worktop area to lay out 12 plates prior to service. Down below, the four principal guest cabins are arranged on the four sides of a square central lobby. Three have double beds, one has twins which can slide together as well as a fold-down pilot berth, and all, of course, are fully en suite with spacious heads and shower rooms. 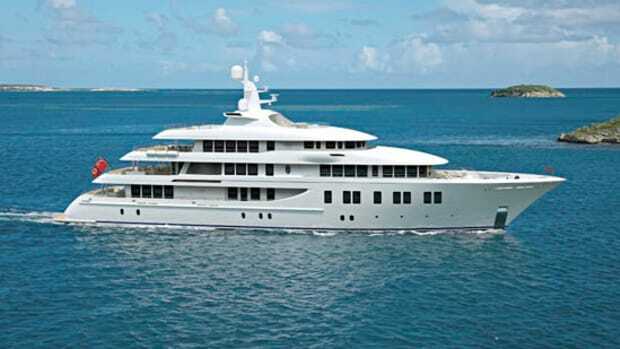 Each also has three large hull windows to admit plenty of daylight. Further forward, accessed via stairs alongside the galley, the crew accommodations comprise four en suite cabins and a roomy mess area, while just aft of midships, the machinery space is beautifully engineered and exceptionally well organized, with a separate pump room and electrical compartment. Just the one engine option is available, and with more than 6,000 hp available, it should be perfectly adequate for most owners. 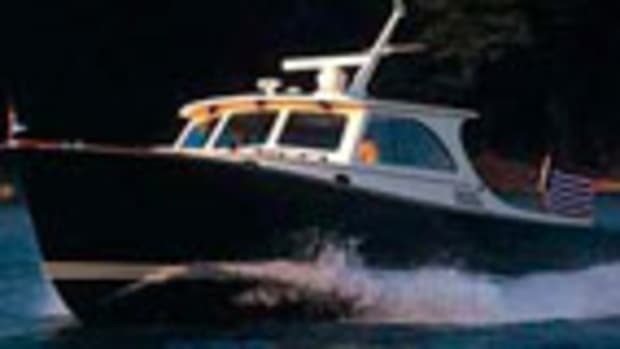 Top speed is said by Sunseeker to be 25 knots. Engine room access on this yacht is via the port side of the cockpit. Leading aft from the machinery space there is also internal access to a big tender garage, which has room for two substantial jet skis and a chunky, 19-foot Avon 580 RIB. The two-level owner’s suite, complete with portside fold-down balcony, has to be seen to be believed. On a three-decker like this, the designers often hold their trump cards for the upper deck. The sleeping accommodation is taken care of, and so are the main entertaining and catering areas. Upstairs is the place for a little fun—something unexpected and surprising—and Tanvas doesn’t disappoint. 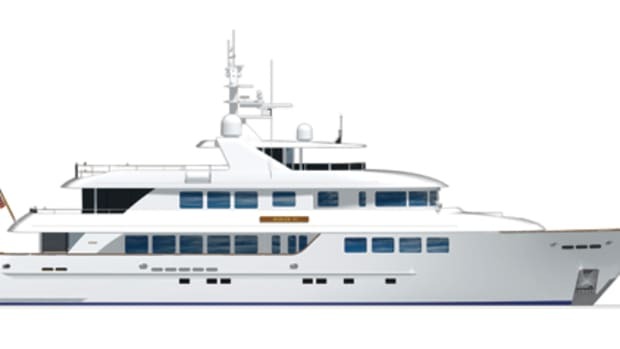 With no side decks to accommodate, the upper deck spreads across the 40 Meter’s full beam, and the secluded, private saloon up here is every bit as big as the main saloon below, with a game table over to port, a dedicated bar, and forward on the port side, a sideboard linked by dumbwaiter to the galley below. Elegant, curved glass doors lead outside. This space, too, not only rivals the yacht’s main cockpit underneath, but being set well above quayside level provides an excellent spot for an alfresco lunch in port, without the worry of being spied. 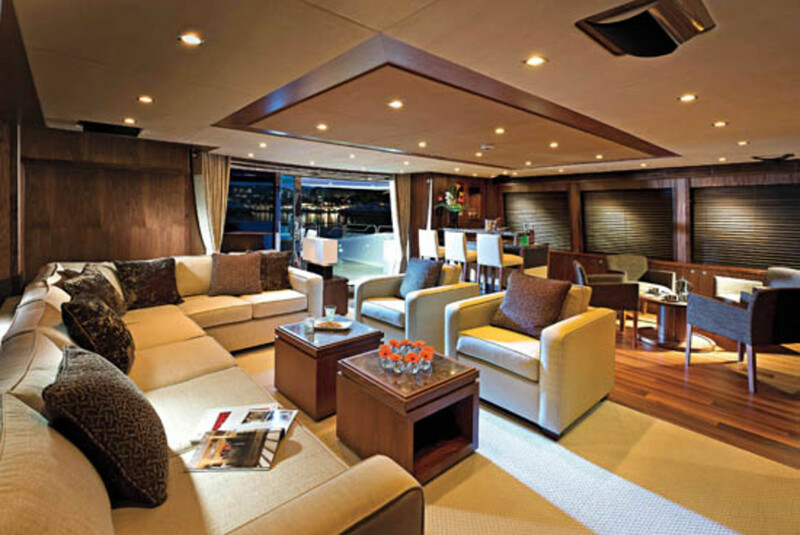 Further forward, close by the wheelhouse—a fully professional setup with excellent visibility, a central helm seat, and a big sofa along the aft bulkhead for back-seat drivers—what would normally be the captain’s cabin on the starboard side has been fitted out on Tanvas as an extra VIP suite. 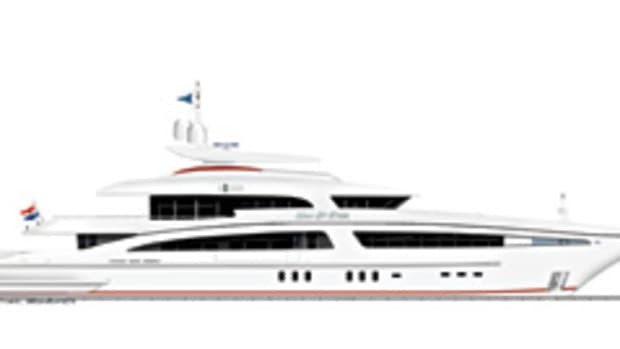 It’s not especially large for a VIP, but it has a huge window and an elevated outlook and looks certain to be the yacht’s next most-popular cabin after that spectacular master suite. Up one more level, and everything is laid on for dedicated sun-worshippers, with a hot tub (glass sided! ), acres of upholstered sunbathing space and open deck for sunloungers, as well as a bar, seats, and a table. There is another relaxation area down forward on the house roof, overlooking the foredeck. In fact there is so much space available aboard the Sunseeker 40 Meter that it’s hard to imagine a charter party of 12 making much impression. Nevertheless, Tanvas’ guests are in for a treat. The tropical paradise of her eventual home waters in Thailand could hardly be more of a contrast to the industrial backdrop of Southampton, where she made her public debut in the sort of conditions that turn umbrellas inside out. She will ensure that there is some corner of a palm-fringed anchorage that is forever England—probably without the fantastically unreliable weather. See more photos of Tanvas on PMY&apos;s Facebook page, here.